Guess what's for dinner Joan? Whatever Happened to Baby Jane, one of the campiest and nastiest movies of all time premiered 50 years ago tonight. The movie really was perfect for release on Halloween since it was psychological horror. Baby Jane starred Bette Davis and Joan Crawford, two Hollywood legends who were getting on in years, as two showbiz sisters who get on each other nerves throughout the flick (to say the least). 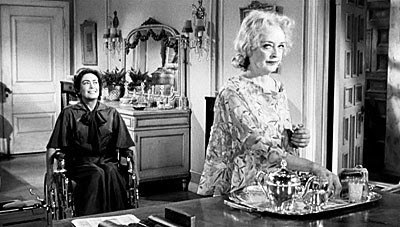 Joan Crawford plays the crippled sister who Bette Davis cares for out of guilt due to her complicity in a car accident (or so it seems but I will not give the plot away). In this famous clip, Davis serves Joan a special treat for lunch. Director Walter Hill is planning a new remake and has gained funding, many suggestions in websites that the film would be starring Glenn Close as Jane and Meryl Streep as Blanche. On interesting aside- Davis and Crawford could not stand each other. Bette Davis was nominated for best actress in the role. In earlier times, it was considered bad form for actresses to actually show up and claim their award on many occasions; they frequently claimed they were sick and had famous replacements accept the awards for them (such Prima Donnas!). Bette Davis was nominated for Best Actress in this film. The other nominees for Best Actress were Anne Bancroft in "The Miracle Worker", Katharine Hepburn in "Long Day's Journey Into Night", Geraldine Page in "Sweet Bird of Youth," and Lee Remick in "Days of Wine and Roses" - all superb performances. Joan Crawford contacted every other nominee and offered to accept the Oscar for them if they won, and they all agreed -- just in case Bette Davis lost. Anne Bancroft won the Oscar for her excellent portrayal of Anne Sullivan, Helen Keller's teacher in the Miracle Worker (along with a very young Patty Duke who won Best Supporting Actress for her portrayal of Helen Keller) and Joan Crawford accepted the Oscar for her! So bitchy. You can see Joan putting Bette Davis down here. Look at the smile on her face! Here is one famous scene from Baby Jane, the "lunch is served" scene. Ahhhhh. The good old days of short, dignified Oscar acceptance speeches.